IntelliJ – Java, SQL and jOOQ. If you’ve ever had a look at compiler source code, you cannot help but be glad that someone else is doing that job for you (the same is true when you look at jOOQ’s or Hibernate’s sources, by the way). Where are we at with our compilers? … although, you probably don’t want to go to production with such an early access release. IDEs building with javac, and Maven, of course, work equally well. Eclipse is lagging a little bit – which can be annoying at times. A vegan, an IntelliJ user, a Mac user, and a Linux user walked into a bar. AFTER 2 MINUTES, THE WHOLE DARN BAR KNEW! The fact is, all of the compiler teams are working hard to fix loads of bugs. IntelliJ, even while using javac to compile, may still display some false positives, visually in your IDE. Geertjan from NetBeans has just recently fixed a whole pile of bugs that we’ve reported. And Eclipse, well, Eclipse ships with their own very sophisticated incremental Java compiler. It’s a great compiler for rapid prototyping, but the drawback is that it compiles stuff slightly differently from others. We’re getting there. If you can, make use of lambdas and streams, and apply as much type inference in your code as possible. And please, if you do discover a bug, report it. We’re probably all using one of those three IDEs. Every bug that you report, is one less obstacle towards Java 8 adoption. Some things are just very very very VERY very important. Such as John Cleese. Yes. 1080 Reddit Karma points (so urgently needed!) in only 23 hours. That’s several orders of magnitudes better than any of our – what we wrongfully thought to be – very deep and interesting technical insight about Java and SQL has ever produced. Read the full treatise here. But at some point, the whitespace discussion is getting stale. We need new very very very important topics to discuss instead of fixing them bugs. After all, the weekend is imminent, and we don’t know what else to talk about. OK, that was a no-brainer. We’ve already had that. Want to participate? The very interesting Reddit discussion is still hot. In case you haven’t heard of this highly interesting discussion, there are some people who believe that ORMs are outdated, because ORMs don’t work as promised. And they’re totally right. And the best thing is, all the others are totally right as well. Why is that great? Because that means we get to discuss it. Endlessly! Why should we care about his opinion? We have our own, far superior opinion! Let’s have another discussion about why ORMs are evil! Unfortunately, us Java folks cannot have any of those very very very very very important discussions about casing, because unfortunately, Java is a case-sensitive language. SELECT TAB. "COL1", TAB. "col2" FROM "FROM"
Should classes be PascalCased and literals be UPPER_CASED? Should everything be PascalCased and camelCased as in Java? Should everything be generated as named in the database? -- Or I'll telefax you my SQL! And so on and so forth. Now any project manager should reserve at least 10 man-weeks in every project to agree on rules about SQL formatting. Now THAT is a very interesting topic that is not only interesting for developers who are so knowledgeable about productive systems, no it’s also very interesting for operations teams. Because as we all know, the DBA is dead (again). Please, do engage in some more discussions about the best and only true way to tackle database problems. Because your opinion counts! Exactly. Because this allows comments to be written where they belong: Next to the appropriate keyword, and always aligned at the same column. This leads us to the next very interesting question: Should we put comments in code at all? Or is clean code self-documenting? And we say, why yes, of course we should comment. How on earth will anyone ever remember the rationale behind something like this?? 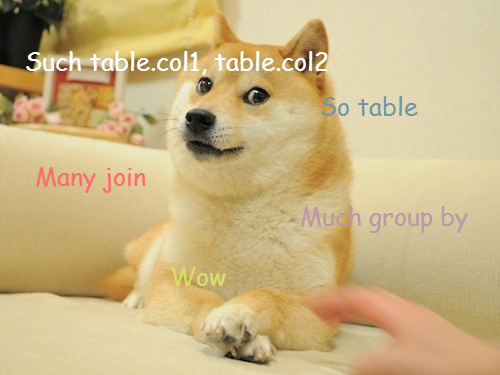 Taken from our “hacking JDBC” page. I love JSON. It's giving people opportunities to recreate the dumbest ideas of the XML era but with curly braces instead of angle brackets. You’re saying, JSON and XML are the SAME THING!? Let’s further discuss this matter. I feel that we’re close to the very ultimate solution on that topic. Can we please, PLEASE, have another very interesting discussion about which one of these is better? Please! 10. Last but not Least: Is Haskell better than [your language]? According to TIOBE, Haskell ranks 38. And as we all know, the actual market share (absolutely none in the case of Haskell) of any programming language is inversely proportional to the amount of time spent on reddit discussing the importance of said language, and how said language is totally superior to the one ranking 1-2 above on TIOBE, for instance. Which would be Lua. Maybe we can iterate over … flatMap that s***! Now, of course, we could enlargen the debate and compare functional programming with OO programming in general before delving into why Scala is NOT a functional programming language, let alone Java 8. Such great topics. So little time. The great thing about these social networks like Reddit, Hackernews, and all the others is the fact that we can finally spend all day to discuss really really intersting topics instead of fixing them boring bugs our boss wants us to fix. After all, this is IMPORTANT. Tom Wijsman – Should curly braces appear on their own line? Adam Davis – What is self-documenting code and can it replace well documented code? Are `break` and `continue` bad programming practices? Or add your own. There’s still much much important writing to do!